Remove light to moderate imperfections while protecting the paint! The Meguiar's D166 Ultra Polishing Wax allows you to remove imperfections, while leaving behind a durable layer of protection in one easy to use solution! We all know that detailing can be extremely time consuming and manufacturers have taken note. Each year more game changing products are coming out that bridge gaps and combine detailing steps. These items allow you to perform multiple detailing steps at once, saving you time and money! D166 is packed with gentle polishing particles which allow you to remove defects at a fast rate. The durable blend of synthetic polymers, silicones, and carnauba wax, allow you to not only leave behind a corrected surface, but a protected one as well! Meguiar's believes you will be amazed at the cutting ability that surpasses a popular Meguiar's product like D151 and D301. This makes swirls, RIDS, light scratches, oxidation, etc. no match for the corrective ability of this formula! Apply via hand or using a polisher and once you are finished wipe away with a clean microfiber towel. The protection will add a nice warm glow and rivals the durability of the popular M21. After application, allow D166 to cure for 12-24 hours before exposing to weather, or topping with a coat of wax for optimal results. 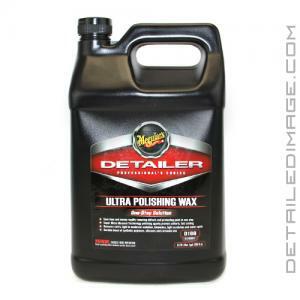 If you are looking for a great all-in-one (AIO) product, the Meguiar's D166 Ultra Polishing Wax is a great choice! Meguiar's Ultra Polishing Wax is a revolutionary new all-in-one product that allows for considerable defect removal in a single step, while simultaneously leaving our most durable protection yet from a cleaner wax. Developed for both foam and microfiber pads, as well as for hand application, dual-action, forced rotation and rotary machines. DIRECTIONS: SHAKE WELL. Work in the shade on a cool surface. Apply products to your pad or disc of choice and spread evenly across the entire surface. Work a 2'x2' area at a time, applying light to moderate pressure. For each successive pass, apply just 3-5 drops of product to the pad/disc surface and work in the area with overlapped passes until high-gloss surface is achieved. Remove residue with a Meguiar's X2020 Supreme Shine microfiber towel. Little on the expensive side, but well worth it. Like to use it a lot. I found this product thru another detailer who had received it by error. I have used three gallons mostly for express wax applications and have been quite impressed with durability and finished look. A winner for my use. I use this product in a Dealership environment. It brightens the paint while correcting fine type wash scratches and leaves a nice smooth finish behind. Comparing with HD Speed, HD Speed does an all around better job but Meg is quite a bit less in cost. Cost to Quality, Ultra Polishing Wax is a good buy and decent product. Thumbs Up!